Ready to experience the best beach America has to offer? Well, we have your front row RV camping spots! Our RV resorts are located less than 30 minutes away from beautiful Siesta Key Beach, ranked the country's #1 beach by Dr. Beach and TripAdvisor. 8 miles of the worlds finest, whitest sand stretch out in front of the sparkling gulf. You'll hear the sand described as sugar sand, soft and plushy, never getting hot, even on Florida's steamiest days. That's because this gorgeous sand is made up of 99% pure crushed quartz. Beyond the sand, the beach is 200-300 feet wide in some places, which means that even though it's popular, there's lots of room to spread out. And that's just what beachgoers do, whether they are swimming in the torquiose water, playing frisbee or catching rays, it's always a good time at Siesta Key. This beautiful beach is on a barrier island on the Gulf of Mexico, located just south of Downtown Sarasota. 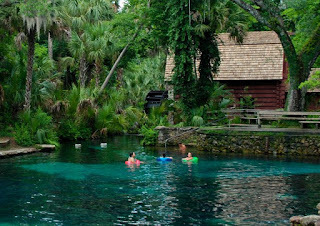 Most days, the water is calm and shallow, which is perfect for swimming. You won't have sharp drop-offs so kids and adults alike can swim happily. Plus. The beach has natural dunes too! Kids will love building sand castles in the sugar fine sand. But it's not just kids who love creating masterpieces at Siesta Key. Each year, the beach holds the Siesta Key Crystal Classic, an international sand sculpting competition. People come from all over the compete, and to admire the beautiful pieces of work. Unlike most beaches, Siesta Key features a lot of (free) parking, along with a free trolley service to and from the island's downtown. The adorable downtown features a plethora of dinging and shopping options, plus frequently hosts festivals, including dining and art shows. Come vacation at the nations best beach! Enjoy amenities at our RV resorts like large concrete pads, full hook-ups, friendly residents, events, great amenities and more! This summer, stop by for our communities annual Summer BBQ, hosted by Newby Management. Grab a heaping plate of BBQ chicken, potato salad, a roll and some delicious cake. We hope to see you there. The Sunshine State. You know us for our beaches, great theme parks and amazing food. Now let's talk about what you don't know. 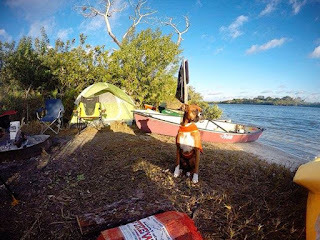 Here are some tips and you need to read before you come camping in the wild lands of Florida. Let's talk tip numero uno. Okay, so you know we're the Sunshine State, we covered that. But did you also know Florida has a wet season and a dry season? It's true! You might think summer is a great time to visit (and it totally can be), but it's also the wet season. Most days are above 80 degrees, and with the heat index it can feel like a whooping 100 or more. It rains most afternoons, sometimes raining all day. Plus, the hot and wet weather is bad for you, good for mosquitoes (so again bad for you). Basically what we're trying to say is, there's a reason people LOVE winter in Florida. It hardly ever rains between December and May, but the weather is usually mild and sunny. Now that is paradise! remember to use slow movements and never make eye contact. Most importantly, secure your food and never feed the animals. Sometimes animals can get very comfortable around people, especially if they are used to being served dinner. Don't let them decide you'd make a good dinner. Let's say you do try to brave Florida's summer. You're still in for a treat because we have lots of neat stuff to do, BUT you will have to contend with the bugs. Remember to bring lots of bug spray and citronella candles. A good tip to remember is to use the spray on your clothing and not your skin. Also wrap up some dried sage to toss on your campfire. It helps act as a natural bug repellant that will help keep your skin bite free! Don't forget the cortisone incase any bugs get past your barriers. This probably goes for most states, but Florida has some strict laws about open fires, especially in the dry season. 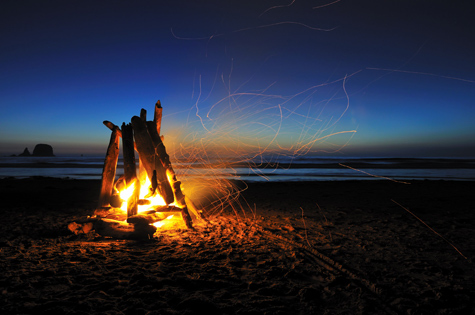 You'll get good weather, but double check with your campground before lighting those s'mores! Many campgrounds require special permits or containers for fires. This is because the dry season sees a lot of brush fire, so it's one way to keep our forests, animals and campers safe. You can totally tell ghost stories around the fire, just make sure to do it legally. Florida is hot. You know this, but unless you're from Florida you might not understand how hot it truly gets. Even in the winter the temperature can climb into the high 80's. Whether you are tent camping or RV camping, make sure you have enough water. You definitely don't want to find yourself dehydrated in the woods. Don't underestimate how much water you'll need, especially when it's hot out. Stay hydrated and cool throughout the day. Remember, Florida is fun, but we do have some ground rules. Now go enjoy the great outdoors! The days are getting longer, the sun is coming out and summer is on its way! It's the perfect time to go RV camping and make some amazing memories. Before you take off on your next adventure, here are some ideas to get the good times rolling. Seriously? Are we the only ones drooling over this idea? It's simple, but perfect. Simply grab a stick, a package of cinnamon rolls and a fire. 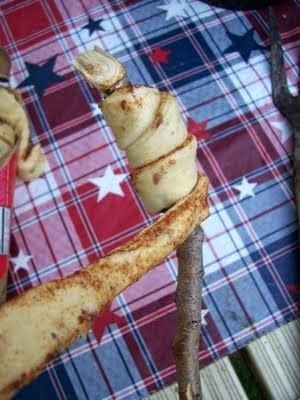 Roll the uncooked cinnamon roll around the stick and place it over the flames. In minutes you have a hot and delicious camping treat without all the cleanup. Okay, now you're drooling! There are so many reasons this is the perfect summer RV game. You can easily transport it, it's disposable, and all you need are a couple glow sticks and a stick. If you have kids (or kids at heart) with you, this is a must-try summer night activity. Clearly the lesson here is stock up on glow sticks! 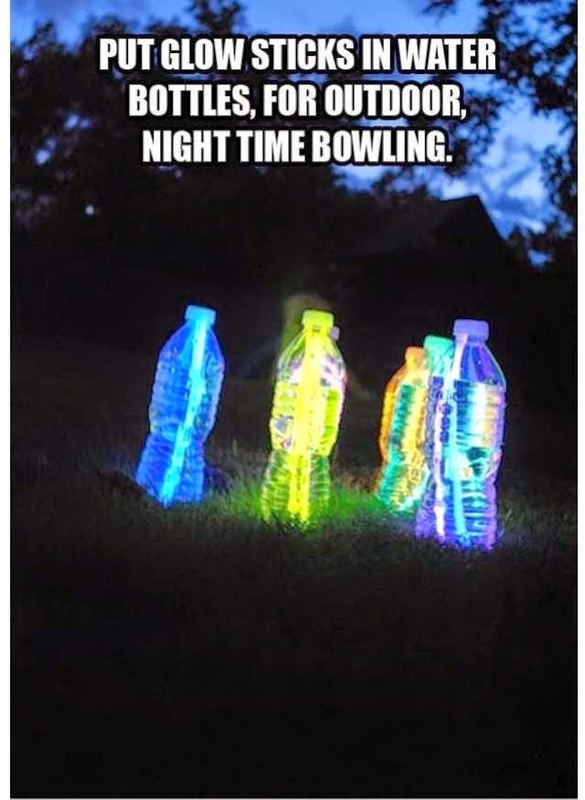 Simply place a glow stick into a water bottle, grab a ball and go bowling! It's fun, fast and easy. Ask everyone to save up their water bottles throughout the day so you have enough to set up the course. Make it a competition. The loser gets to hunt firewood! Love Twister as a kid? Don't bother bringing along the big Twister mat! 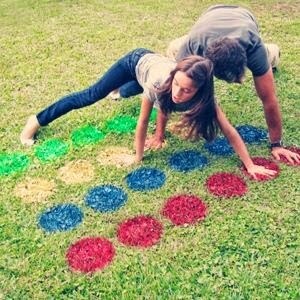 All you need is 4 cans of colored spray paint and you can have a DIY Twister mat anywhere you go. either create a spin board or have a crazy family member yell out colors. With a few balloons, trees, and a stick you can have a fun game in moments. 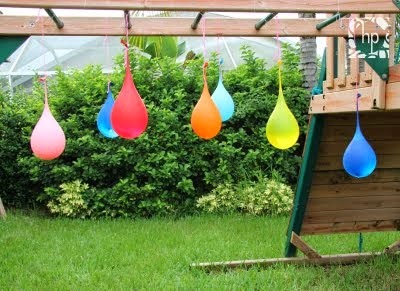 Make sure the balloons are full to the brim with water so they break easily. Use some string to tie the balloons to tree branches. Make the higher balloons worth more points (unless you are playing with lots of short people!). Sometimes we forget to explore the places we are camping. These fun scavenger hunts will get your blood pumping, give you something to do, and let you explore the area. Split your group up into teams and go find some cool stuff. 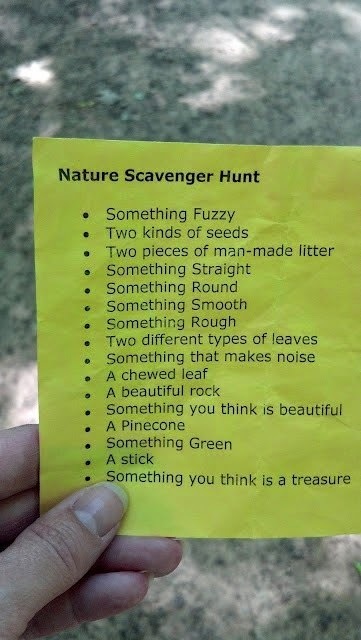 If you research the RV park or campground before you go you can use specific clues from the park to create your hunt. 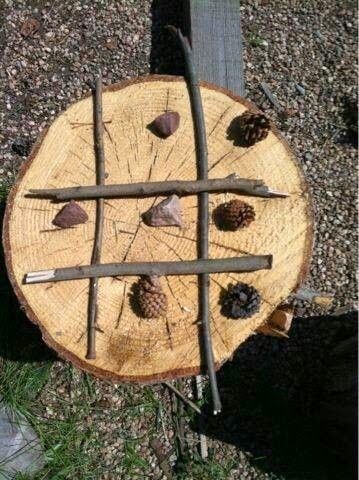 Everyone has played tic, tac, toe, but this is a new twist on the game that will make outdoorsy people fall in love with it all over again. Gather up four sticks, some stones, and some pine cones and have a good old fashioned time. This game is fun, competitive and will get your family moving. The best part? You just need a rope. 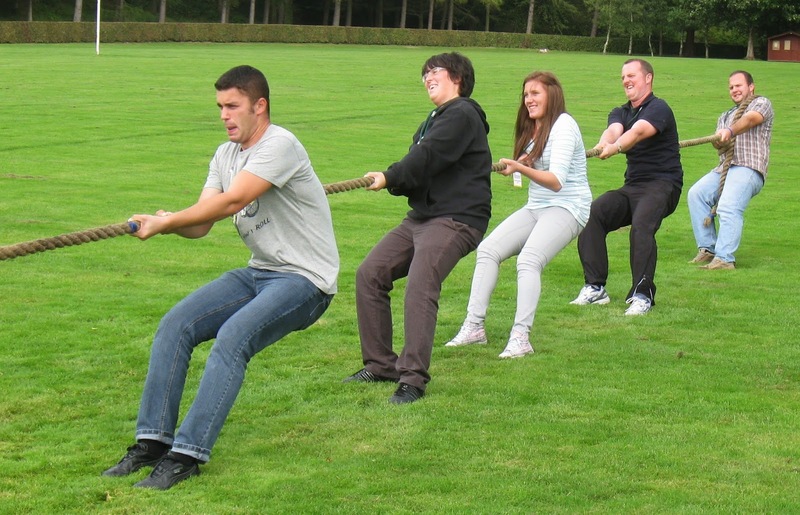 Tug of war is an age-old game that is sure to deliver plenty of laughs. Plus it can be played anywhere, so it's both portable and tons of fun. Bocce ball is a fun game that's storming the nation. 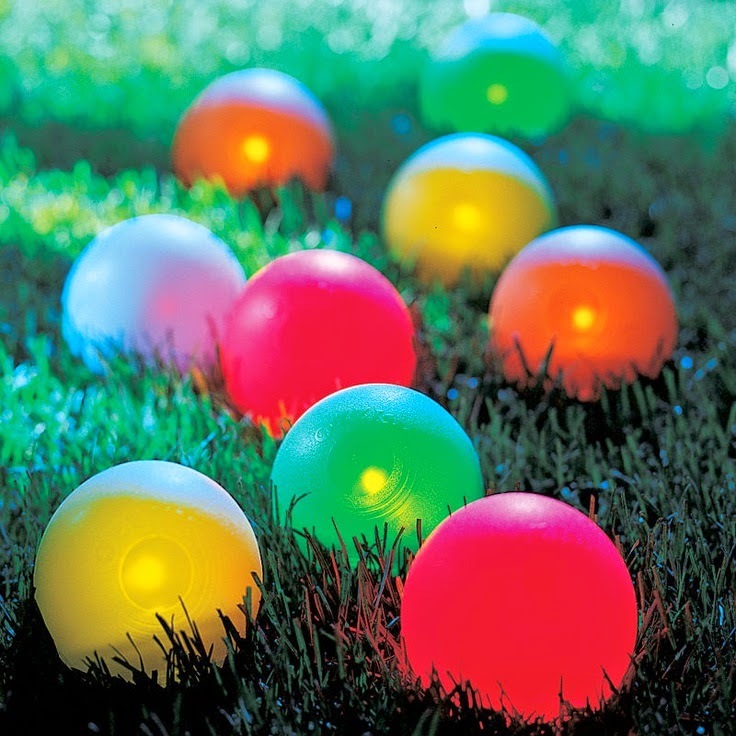 This light up set is perfect for those summer nights in the RV. You can see these balls from up to 100 feet away, too! Play in the sun, play in the moonlight, play to your heart's content. With some glow in the dark paint and an old sheet, you can have lots of fun for the kids. 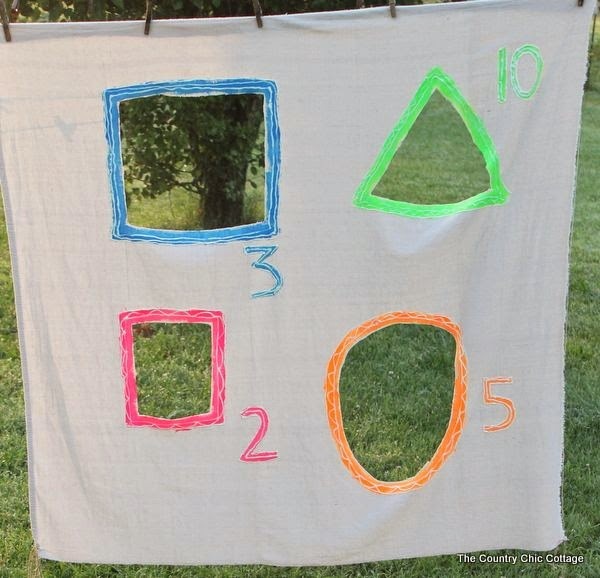 Cut holes into different shapes into a large sheet. Outline the holes with glow in the dark paint. At night, hang the sheet and grab a few balls. Each hole is worth a different amount of points. The person with the most points at the end wins! 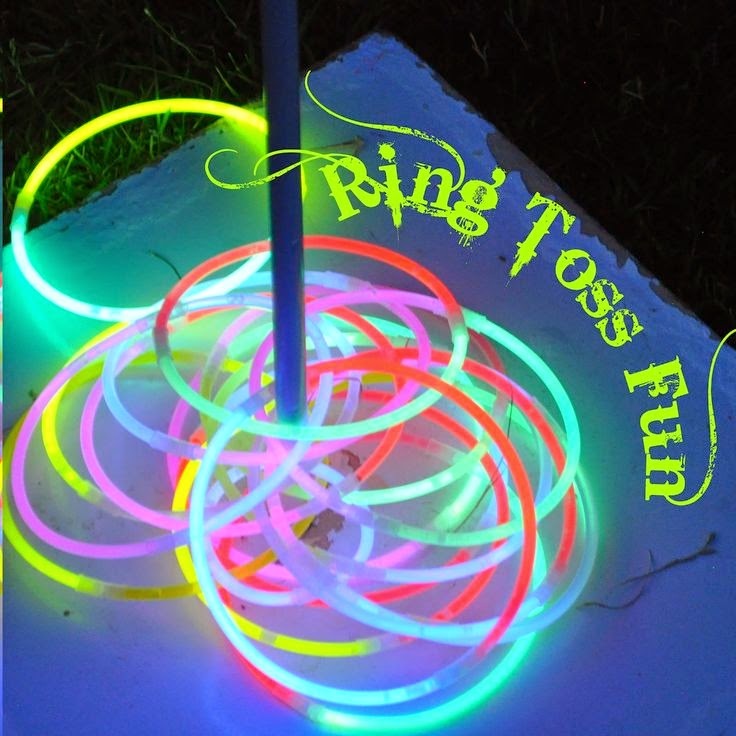 This is a portable, easy and fun game that they whole family can play. What summer camping game ideas do you have? Thinking of joining the ranks of RV campers? Let us tell you 3 secrets you aren't going to hear from anyone else! We all love new things. Maybe it's that "new thing" smell or how shiny and untouched they look. Whatever it is, new doesn't always mean better. When you are preparing to join the ranks of RV campers, consider buying a used RV. You'll definitely want to do some research, but you can find the perfect home for you at a much lower cost. Plus, don't forget about doing DIY projects in your used RV camper to make it all your own. 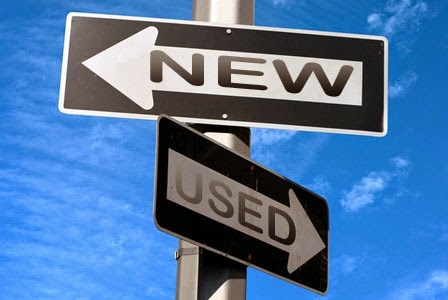 Thinking of buying a used RV? Here are some questions to ask before you buy a used RV. We love amenities! Who doesn't love swimming pools, shuffleboard courts and other fun activities? But even the most expensive RV park with the best amenities can't compare to a place you consider home. It can't compare to the place where you have family. It can't compare to the place where you've loved and laughed for years. 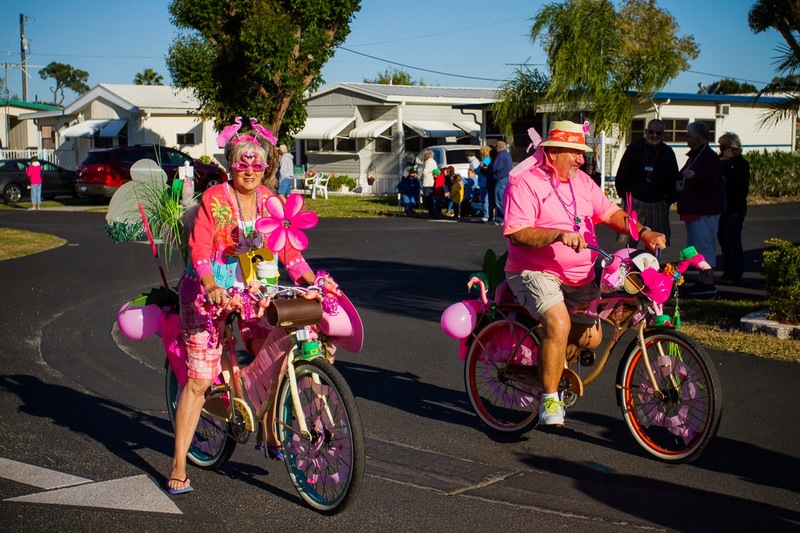 We believe that the best RV parks are the ones where people love to stay there and have a blast when they do! But shhh that's a secret! Look into programs like AAA, Good Sam's, Passport America and some of the others. You can get up to 20% off a daily reservation rate. Also don't forget to ask the park about military discounts, senior discounts and others! 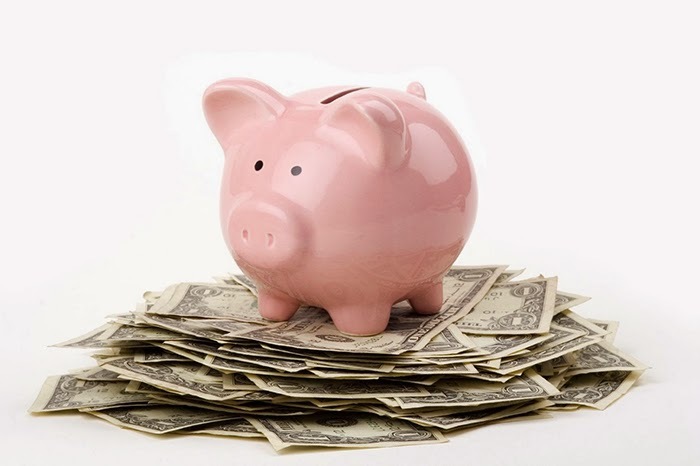 You might be surprised to find out that you could save quite a bit of money. What RV camping secrets do you have? We'll add more as they come in!